Whether you opt for an electronic assistant like Alexa or have your thermostat programmed to work remotely, it is highly likely technology has moulded parts of your home. 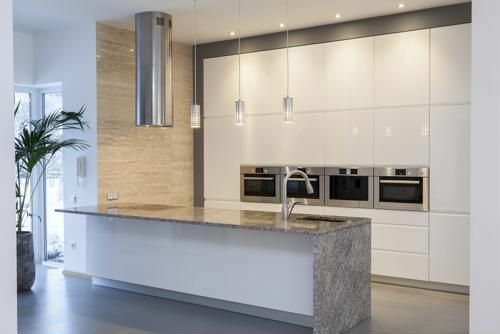 In fact, you may be considering kitchen renovations to incorporate more automatic or remote-controlled appliances into the space, such as a stove that can be adjusted to perfectly match your cooking needs. Recently, Builder Magazine explored whether it was essential to have such "smart" accoutrements in a thoroughly modern kitchen. The magazine's conclusion: while some gadgets can make life easier, design is what truly reflects whether space is contemporary or traditional. Designer Michael Schluetter was interviewed for the piece in Builder Magazine, and it was his opinion that simplicity was key when creating a more current kitchen area. Instead of shiny, glossy kitchen countertops, faucets and fixtures, the trend is to have matte, smooth surfaces. Refurbished wood and solid oak elements add an earthy vibe to the space, and have also been appearing in kitchen decor. In addition, Schuetter noted that having connected appliances and the ability to control things remotely was an interesting perk, but not really something upon which a modern kitchen would hinge. It was more important to have a simple, neat space without too many bold patterns and general clutter in the room. Does a "smart" kitchen signify modernity? Similarly, Kitchen and Bath News reported that materials either sourced from or inspired by nature were key elements in designing an up-to-date space. The countertop is perhaps one of the best ways to showcase the overall aesthetic because it needs to be large enough for food preparation and perhaps echoed in the room's focal point, the kitchen island. Since the eye will be drawn to whatever material is selected, the source suggested looking for a kitchen counter with neutral shades. For example, a soft grey or even a smooth oak surface in the aforementioned matte finish will be on trend. Homeowners also want surfaces that are easy to maintain: The space can be multi-purpose to accommodate high traffic and should be relatively painless to keep clean. It seems, then, that the consensus is a modern kitchen reflects what is popular in design currently, and not the technology it contains. While having a "smart" kitchen may be fun, you are likely better off working on a design that incorporates simple, muted elements. For inspiration, meet with a professional at a kitchen and bath showroom who can help you find the right pieces to create a contemporary and trendy space.